Central School of Ballet’s renowned graduate performing company, Ballet Central, will commence its annual tour at Stratford Circus Arts Centre, London, on 28 March. Under the artistic direction of Christopher Marney, Ballet Central’s diverse range of dance and theatre will be staged in 20 venues across England over a five month period, and will go on to perform in Tokyo, Japan. 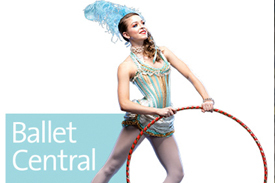 Ballet Central is the touring company of Central School of Ballet in London, the leading centre for professional dance training and education. This season’s repertoire delivers a varied performance of theatricality, technical excellence and drama choreographed by top dance industry influencers. The repertoire includes Christopher Marney’s Carousel Dances, inspired by the 1945 musical Carousel by Rodgers and Hammerstein, a unique version of the Dying Swan Solo created by Calvin Richardson, and an extract from Frederick Ashton’s acclaimed Valses Nobles et Sentimentales, performed to Maurice Ravel’s suite of waltzes. Following the response to Kenneth MacMillan’s piece in the 2018 tour, Ballet Central will present another excerpt from MacMillan’s works, House of Birds, based on the Grimm Brothers’ macabre fairy tale, Jorinda and Joringel. Ballet Central also presents Jasmin Vardimon’s (in between), a physical contemporary work first created with the National Youth Dance Company in 2013. And for the first time, Ballet Central is collaborating with Thiago Soares, principal dancer with the Royal Ballet, who has created a new work with Ballet Central’s young dancers, which will be premiered in London at a series of performances at the Bloomsbury Theatre in July. The annual Ballet Central tour offers audiences across the country the chance to see the company’s young and dynamic dancers showcase the best dance theatre from current industry professionals alongside newly-commissioned work and refreshed classics from the world’s top choreographers. Ticket prices are deliberately low in order to make the tour widely accessible in each venue.